NASA's Advanced Spaceborne Thermal Emission and Reflection Radiometer (ASTER) acquired this image of Peru's Sabancaya stratovolcano on April 10, 2019. 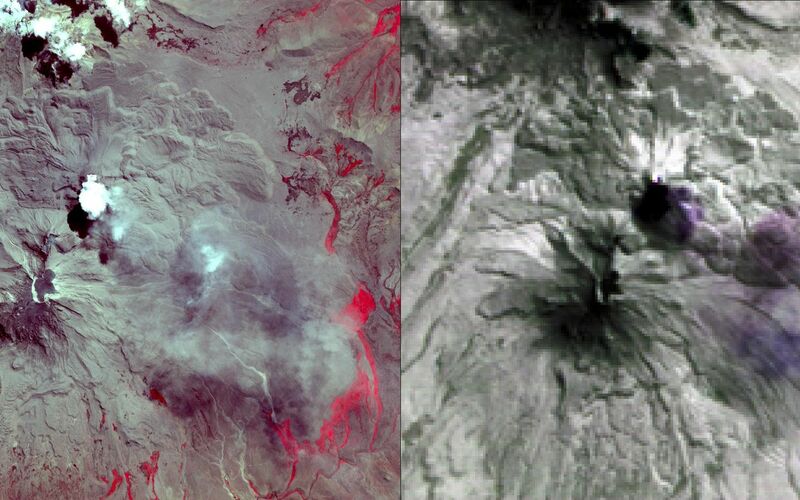 Sabancaya has been erupting regularly for several months, sending ash plumes high into the air. At the time this image was taken, the plume reached an altitude of 9100 meters (9950 yards) and was moving southeastward. 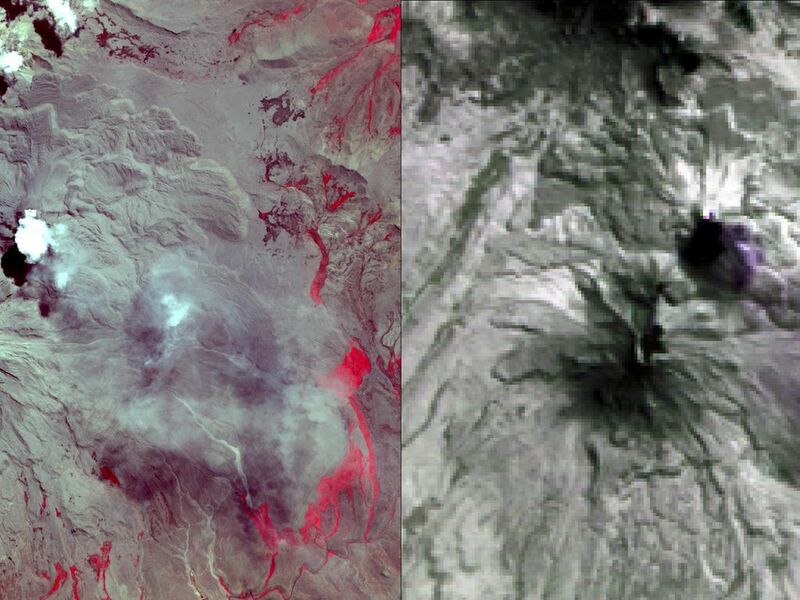 In the left image, Sabancaya is under the bright round white cloud. The greyish clouds to the southeast are ash plumes. The Ampato volcano, with its prominent summit caldera, is to the south. The red areas are vegetation. 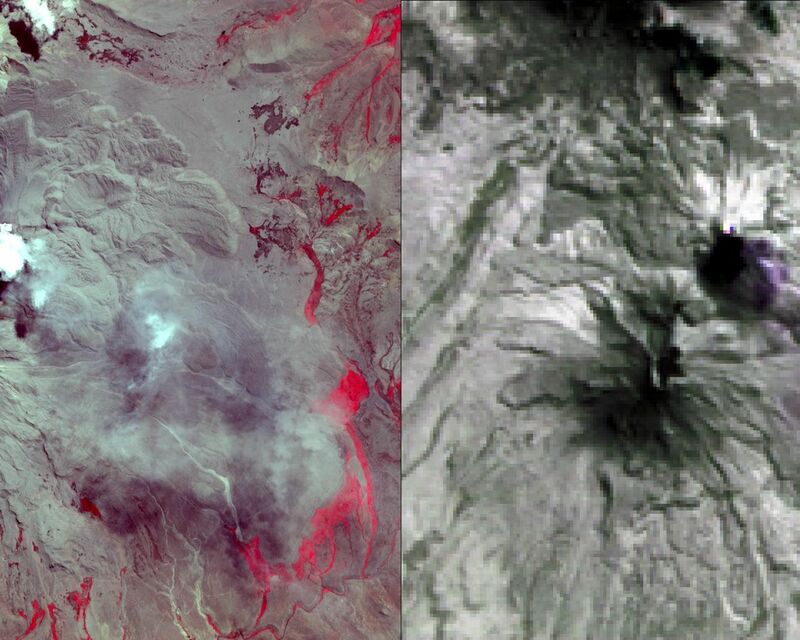 The right thermal image shows the plume in purple, indicating that it is dominantly composed of sulfur dioxide gas. A bright hotspot can be seen directly north of the black (cold) cloud over Sabancaya. The image covers an area of 19.5 by 17.2 kilometers (12 miles by 11 miles), and is located at 15.8 degrees south, 71.9 degrees west. With its 14 spectral bands from the visible to the thermal infrared wavelength region and its high spatial resolution of about 50 to 300 feet (15 to 90 meters), ASTER images Earth to map and monitor the changing surface of our planet. ASTER is one of five Earth-observing instruments launched Dec. 18, 1999, on Terra. The instrument was built by Japan's Ministry of Economy, Trade and Industry. A joint U.S.-Japan science team is responsible for validation and calibration of the instrument and data products. The broad spectral coverage and high spectral resolution of ASTER provides scientists in numerous disciplines with critical information for surface mapping and monitoring of dynamic conditions and temporal change. Example applications are monitoring glacial advances and retreats; monitoring potentially active volcanoes; identifying crop stress; determining cloud morphology and physical properties; wetlands evaluation; thermal pollution monitoring; coral reef degradation; surface temperature mapping of soils and geology; and measuring surface heat balance. The U.S. science team is located at NASA's Jet Propulsion Laboratory in Pasadena, California. The Terra mission is part of NASA's Science Mission Directorate, Washington. More information about ASTER is available at http://asterweb.jpl.nasa.gov/. NASAs MODIS instrument, aboard the Terra satellite, captured this true-color image showing the remnants of a meteors passage, seen as a dark shadow cast on thick, white clouds on Dec. 18, 2018.